One phone call. That's all it took to change Stephanie Wittels Wachs' life forever..
Stephanie Wittels Wachs is a writer whose work has been featured on Vox, Longform, Huffington Post, Fatherly, Mamamia, Babble, and Medium. 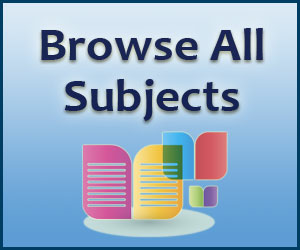 Other significant roles include mother, theatre artist, educator, and voice actor. She graduated from New York University's Tisch School of the Arts and went on to receive her Master's from University of Houston School of Theatre and Dance. She is co-founder of Rec Room Arts, a non-profit arts organization committed to developing innovative work across disciplines. Find her comedic musings on parenting (and life) on her weekly podcast, "Hands Off Parents." She lives in Houston, Texas with her family. A penetrating story about the author's experience witnessing addiction claim her brother's life.Writer, theater artist, and educator Wachs and her younger brother, Harris Wittels (1984-2015), a comedian best known for his work on Parks and Recreation, were practically inseparable as children, and they grew up to become best friends as adults. So when Harris confessed to being a drug addict three days before the author's wedding, Wachs was understandably devastated. Over the next few years, as Harris battled his addiction and bounced in and out of rehab, the author gave birth to a baby with a permanent hearing disability and was suddenly faced with the emotional stress of worrying about her child's future while simultaneously fearing for her brother's life. Her worst nightmare became a reality when she got a phone call telling her that Harris died of an overdose, alone in his Los Angeles home, just days before he was set to move to New York for a new job. 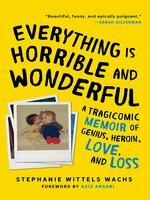 The narrative alternates between stories from before the tragedy--what growing up in the Wittels home was like, how Harris fell in love with comedy and turned it into a career, how Wachs started her own family, how everyone dealt with Harris' addiction--and the author's descriptions of life "after," in which she speaks directly and candidly to her brother about the year that followed. In unflinching detail and with remarkable openness, Wachs describes the ugly and complicated nature of mourning someone who was not only a brother and best friend, but also an addict, a public figure, and a comedic genius whose life was cut off at the very cusp of success. Photos, texts, and correspondences, along with a touching foreword by comedian, actor, and close friend Aziz Ansari, enhance an already rich book.A powerful debut that will resonate especially with readers who have loved and lost someone to addiction. Wittels Wachs’s first book sweetly but prosaically recounts the months leading up to and following her brother Harris’s 2015 death from a heroin overdose. In her recounting of her brother’s past and his rising success (he was a writer and executive producer for Parks & Recreation), she hopes to find some meaning behind his death. With each chapter, the perspective switches between first-person recounts of Harris’s life and a charming second-person address to Harris (“Visiting the cemetery isn’t a natural urge, but the day before your birthday I force myself to go... It’s also April 19, the two-month anniversary of your death”). Wittels Wachs shares anecdotes, scripts, messages, and letters of Harris’s that display his acceptance of his friends’ foibles: she quotes her brother at his funeral, saying, “‘Let’s stop finding a new witch of the week and burning them at the stake. We are all horrible and wonderful and figuring it out. ” Wittels Wachs can be a little too self-involved, as when she concludes that her brother’s death is a personal affront (“It all... feels like a punishment for some transgression in a past life”). Nevertheless, the story itself is a well-intentioned, honestly told one of love for and loss of an exceptional person. 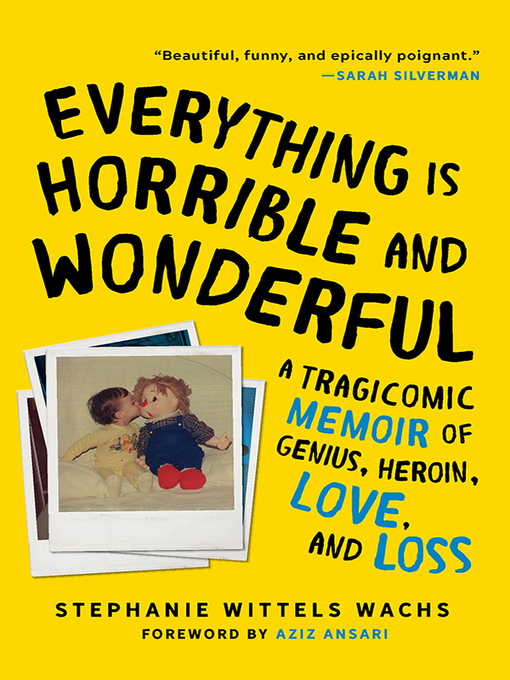 Sarah Silverman "Beautiful, funny, and epically poignant." Bill Clegg, author of Portrait of an Addict as a Young Man and Did You Ever Have a Family "Human and heartbreaking, this sister's story of living with and losing a brother to addiction is a doozy. A great read and an intimate and illuminating account of an addict's impact on a family." David Sheff, author of Beautiful Boy and Clean "Every minute more of us know the unique pain of helplessly watching someone we care about descend into the pit of addiction. Stephanie Wittels Wachs has been there, and she emerges with her wit, wisdom, and spirit intact. This remarkable and movingly told story will break and mend hearts." Matt Logelin, author of Two Kisses for Maddy "Brutally honest and honestly beautiful, Everything Is Horrible and Wonderful is so much more than a story of how addiction can tear a family apart; it's a magnificent tribute to a brother and to the perfectly imperfect family that we all have. The clarity with which Stephanie Wittels Wachs describes addiction, death and its aftermath comes through on every page...she lays bare the ugliest truths without demonizing the destructive behavior of an addict. Threaded through with the fiercest unconditional love, this is an absolutely gorgeous book." Kerry Cohen, author of Loose Girl and Lush "Stephanie Wittels Wachs is honest, funny, moving, and so likable. She shows us the messy truth about losing someone you love - that there is no map for its tremendous pain and unexpected moments of joy." Houston Chronicle "As described in this touching memoir, grief is a familial phantom limb constantly tapping the shoulders of the survivors...a story ultimately about renewal and hope.